Fruity Shake info about the game-Games2Rule. Ever had a stint working in a fruitful job?? The orders pile up on the board. You have to make smoothies by adding cream and then by adding the correct number of toppings. That's what fruity shake is all about. 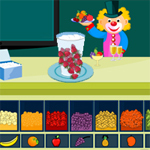 Enjoy some free brain training and go mix those smoothies! In level 4, you'll need to drag the smoothie to the blender and back again.